Medals Gone Missing, the 'not for profit' medals register was established in 2008 with two aims - to locate missing war service medals and return those medals which had been found. Following the Second World War, the population suffered war weariness. Many service medals were sold or discarded for various reasons. However, with the genealogy phenomenon now sweeping the world and the approaching centenary of the Great War, there is a growing desire to recover these missing war medals. Administrator Gary Traynor states, "The Medals Gone Missing website arose from my desire to locate the missing war medals of my great uncles from the First World War". Years of searching through militaria fairs and medal dealerships proved fruitless. It became obvious that this was a needle in a haystack with very little chance of success. There simply was no effective way of telling the world that I was searching for these missing medals. The internet changed all of that. Now, militaria collectors and medal dealers around the world are doing the searching for us. Thousands of medals appear for sale on the open market each week. The first thing a collector does when they acquire a new medal is to research the name on the medal via the internet. The majority of British Commonwealth service medals of the First World War have a name and other details impressed onto them. The 'round' medals are impressed on the edge in very small writing, which often goes unnoticed. Most 'star' shaped medals will be impressed on the reverse. However, generally only the Second World War medals awarded to Australia and South Africa are named. By conducting a simple Google search, if a listing exists for that particular medal, then the Medals Gone Missing website will notify the searcher. There is now a chance that the medals can be returned. Without buying a ticket, you are never going to win a lottery. Medals Gone Missing works in much the same way. Unless you submit a listing and tell the world that you are looking for your grandfather's medals ... then you stand little chance of having them returned to your family. Whilst there is a very small fee to submit a listing, we can assure you that all funds are utilised for the maintenance and running of the site. It is a totally 'not for profit' website run strictly by volunteers. This is why you can put your faith in this system to locate your missing war medals. It was a very happy day when Gary met up with three daughters of Captain Harry Katekar, who served with South Australia's 2/27th Battalion AIF during the Second World War. In December 2010, their father's missing war medals returned home. They had been stolen 27 years previously when Harry's Adelaide home was burgled. A veteran of fighting in Syria and the Kokoda Trail, Harry had worn these medals every Anzac Day since 1945. His sister Helen Drever indicated, "Harry was very upset when they were stolen". After the theft of his medals in 1983, Harry received a replica set which he wore during ceremonial occasions up until his death. However the theft of his original medals must have left a bitter taste in his mouth. Over 27 years later, the Medals Gone Missing Administrator found the stolen medals of Captain Harry KATEKAR being offered for sale on eBay. "I was totally unaware at the time that the medals had been stolen" stated Gary "however I recognised Harry's name from the history books and wondered why they were for sale." I then submitted a listing on the website in the hope of contacting his descendants. A few months later, a casual search on the internet by a grandson of Harry located the medals on the Medals Gone Missing website and Gary was contacted. When I heard that these precious war medals were stolen, so many years ago it nearly bowled me over. Sadly, the good news came too late for Harry - who passed away in 2000. The medals were conveyed to Harry's sister Helen Drever, who was very pleased to learn that the medals had finally been found. 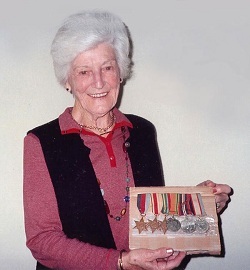 Helen indicated that the family had long forgotten about the medals due to the extensive period of time. Without a doubt, it was just as big a thrill for Gary to be able to return the medals to their rightful place. Harry's daughter Jane walked the Kokoda Trail in the footsteps of her father during 2011 and carried his medals with her to Mission Ridge. It was a very fitting end. It is stories like this which give hope to other families who have fallen victim to thieves or who have no knowledge of the whereabouts of their ancestor's medals. The Medals Gone Missing Administrator wishes to make clear:- "There is always a chance that the medals will turn up, you should never lose hope or give up looking". Gary Traynor has been studying military history for over 30 years. Having served two terms with the Australian Army Reserve, his interests have taken him to many foreign battlefields across the globe and he conducts guided tours of Gallipoli and the Kokoda Trail. He has worked at the Australian War Memorial as a Volunteer Guide before undertaking employment as an Information Assistant and Assistant Curator in the Military Heraldry & Technology section.